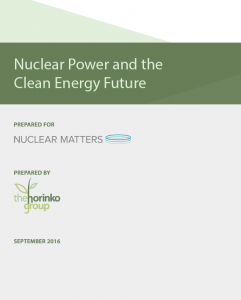 The Horinko Group is pleased to highlight the release of its latest report, Nuclear Power and the Clean Energy Future. On behalf of Nuclear Matters, THG has developed a comprehensive study that underscores the role of existing nuclear power in avoiding carbon emissions and meeting clean energy goals. The report provides an in-depth, data-driven analysis and results in two major contributions to public policy and lawmaking discussions. First, it quantifies the carbon value of U.S. nuclear power, which provides nearly 20% of the country’s electricity supply, while accounting for roughly 63% of carbon-free electricity. The report finds that nuclear power avoids over 531 million tons of CO2 emissions per year, which amounts to a social cost of over $85 billion by 2020. A collection of state-specific fact sheets accompanies the report, demonstrating the critical role of existing nuclear within each nuclear generating state. Second, the report analyzes how states can best value nuclear power when formulating their compliance pathways under the CPP. Importantly, the adoption of a mass-based approach that accounts for new sources of emissions best values existing nuclear power to meet climate change goals. Lead author Emily Hammond discussed the report’s findings in a keynote interview with Chris Godamski, Head of Research, Nuclear, Bloomberg New Energy Finance, at Bloomberg BNA’s September 23, 2016 event, Achieving Clean Energy: The Critical Role of Nuclear Power. Following the interview, Ms. Hammond was joined by Carol M. Browner, Leadership Council, Nuclear Matters and former Administrator, EPA and Rich Powell, Managing Director, Policy and Strategy, ClearPath for a panel discussion on preserving nuclear to meet CO2 goals. Video of the event is available at this link.